Producing articles for the website is extremely satisfying, but on occasions I enjoy simply writing for the sake of it. I also wanted to give something special in the way of thanks to all of you who have returned month by month to make A Season of Happiness a success. My short story is about love and the happiness of a close relationship which should have continued forever. Life, however, is not always obliging; but it does tend to offer compensations that may not be immediately apparent to those suffering a great loss. Brendan O'Connell is one such man. Stricken with grief following the death of his wife, he is convinced there is no longer any purpose in life, until he receives a gift from the grave. His subsequent reactions will not only affect his own future, but will also make one possible for two other people by changing their past. A Gift From The Grave is a tale of hope from hopelessness; thanks to love, understanding and an unexplainable miracle. Being over 6,000 words it is really too long for an ordinary webpage. So we have produced it in PDF format for you to download, print if you like, then read when you have time. That's free, of course. Please enjoy this small gift from us to you. 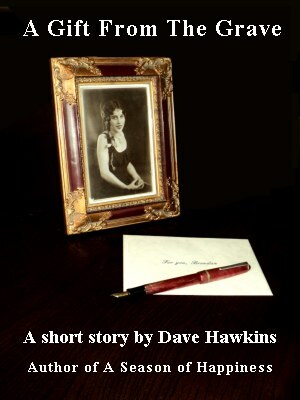 Click this image to view or print the short story.